Peps Safari Breeze, “Katie,” is a sweet 2000 sorrel mare by Badger Safari, NCHA Earnings: $8,665, COA, who is by Peppy San Badger. Badger Safari’s dam, Miss Safari, is a 1/2 sister to the dam of Lins First Bullet (by Bully Bullion) owned by Jim Bean and standing at Bar Y Equine MISS SAFARI $50,789: NCHA Open Futurity Reserve Champion, COA, Bronze Dam of : PLAYIN SAFARI (1990). $88,842: Abilene Western Open Derby Champion; El Cid 5/6-Year-Old Open Champion; 5th, NCHA Open Classic/Challenge; 5th, Bonanza 5/6- Year-Old Open & Abilene Spectacular Open Derbies; NCHA Open Futurity semi-finalist; top 10, Gold Coast 4-Year-Old Open Derby, etc. Miss Safari’s sire Mr Linton is an NCHA Money-earner ($31,587 total NCHA moneys earned; Certificate of Ability), ROM Performance (1978), Performance Point Earner (14 total performance points earned) & Halter Point Earner (6 total halter points earned). SIRE OF: NCHA Money-earners, Performance ROM Offspring (1) and Performance Point Earners (48.5 total performance points Maternal grandsire of Lins First Bullet (by Bully Bullion). CVP Paddys Absolute, “Abs,” is a brown 2002 daughter of Paddys Irish Whiskey. Paddys Irish Whiskey has $12,149 in NCHA earnings, he is an NRCHA All-Time Leading Sire and an Equi-Stat All-Time Leading Reined Cow Horse Sire. His foals have earned $1,479,696 and 4,551 AQHA points, 35 AQHA World/Res. World Championships including 2-time AQHA World Champion Versatility Ranch Horse Smart Whiskey Doc. Abs’ dam is Eternal Enterprise, dam of multiple money earners, including Electrical Spark($5,792), Electric Wire($2,183) and Jacs Eternal Spark($1,559). Eternal Enterprise is by Great Pine, AQHA Show H-25/P-26, ROM Performance, AQHA Champion, Hall of Fame 95 NRHA Inductee. On the bottom side Eternal Enterprise goes back to Mr Gunsmoke, Be Aech Enterprise and more. Pics Bar Bee, “Blackie” is a black 2002 daughter of Pic Remedy, an own son of Doc’s Remedy, out of a Willie War Chic bred mare. This mare has many greats on her papers including Doc Bar, Teresa Tivio, Sugar Vandy, War Chic, and Deck Oiler to name some. She is bred for performance and run and has that look. Very keen head, square body, and a great personality. Blackie loves attention and is easy to be around. With a pedigree like Blackie‘s it would be hard to go wrong to add her to the herd. Blackie color tested as a true black, a/a, but heterozygous main and tail black, E/e. Barb is a cute bay mare by Chics Magic Potion and out of Lizzys Fancy Rose, a Bueno Check daughter. Chics Magic Potion has won NRHA $34,570, NRCHA $246,705, AQHA $12,137, NSHA $, 2003 NRCHA Snaffle Bit Futurity Open Champion, 2003 NRHA Futurity Open-10th, 2004 AQHA World Jr Reining Res. Champion, 2005 AQHA World Jr Working Cowhorse Rs. Champion, 2007 AQHA World Sr WCH Finalist, 2007 AQHA Hi Point Working Cowhorse Champion, 2007 AQHA Hi Point Sr Working Cowhorse Champion, NRCHA Stakes Champion, NRCHA Hackamore Classic Champion, Magnificent 7 Competition Champion, Worlds Greatest Horseman Res. Champion. Lizzys Fancy Rose had NRHA earnings and AQHA points herself. 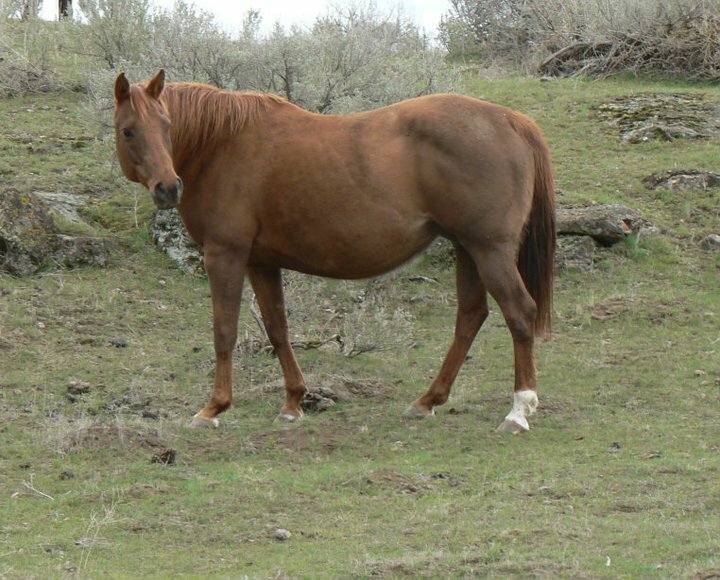 Watch Miss ID, “Twiggy,” is a daughter of ID Watch, a red roan AQHA stallion that has earned his ROM. Twiggy’s breeding also includes Two Eyed Jack on her papers, Watch Joe Jack, Mr. Baron Red, and Do Jack. Twiggy is a very friendly, moderate framed mare that produces some great performance prospects. She is a favorite to visitors coming out, she loves attention and have very personable foals that are fancy. Hottie is our favorite foal of 2009 and is by Cow Cuttin Colonel and out KT Copper Doc Comet. Cow Cuttin Colonel is a major contender in the cow horse industry. A few of his accomplishments include: NRCHA Superior Cow horse, AQHA Open and Amateur Performance ROM, 2008 Paul Dice Memorial Non Pro Bridle Champion, 2007 WSQHA Amateur Hi Point Working Horse Champion, 2006 NRCHA World Show Non Pro Hackamore – 3rd!, 2005 AQHA Amateur Performance ROM, 2005 IRCHA Non Pro Derby Reserve Champion, 2005 Paul Dice Memorial Hackamore Classic Reserve Champion, 2005 NRCHA World Show Non Pro Hackamore Finalist, 2004 WRHA Non Pro Derby Reserve Champion, 2004 Circle Y Derby Amateur Champion/4th in the Non Pro, 2003 WRHA Non Pro Reining Futurity Reserve Champion. 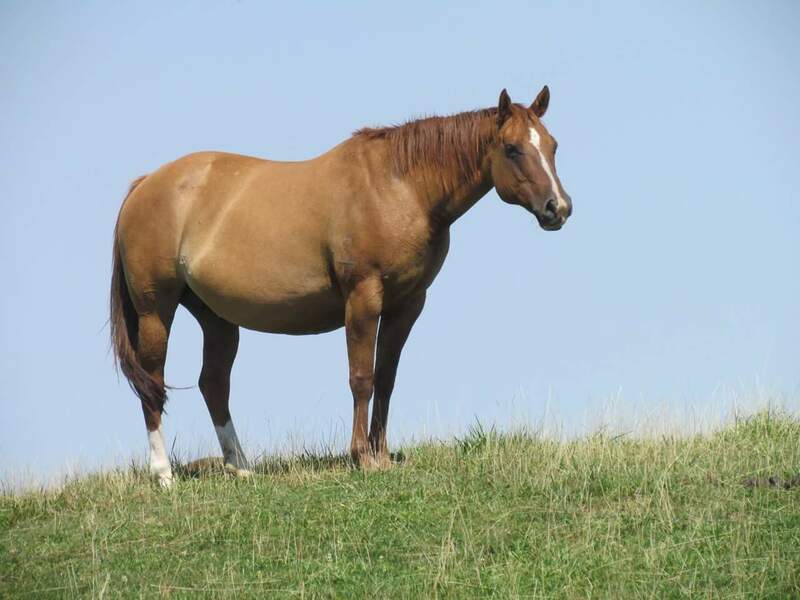 “Comet” is a mare that was shown lightly in some NFQHA and local shows. She was also used a little on the ranch. She is an awesome all around mare that is a favorite to us all. Comet’s dam Robin was a tremendous roping horse, cow horse, was shown 4H, barrel raced on and more. She was a mare with a lot of heart and would give it her all. KT Lend a Hand, “Lendy,” is a stunning daughter of ZInks Major Kid and out of A Tuff Edition, “Tuffy” Tuffy is a very pretty dun mare with lots of chrome; she’s 14.2 hands tall and a combination of cow horse and running horse. Top side is Continental and bottom side is Breeze Bar. She throws chrome and big bone. 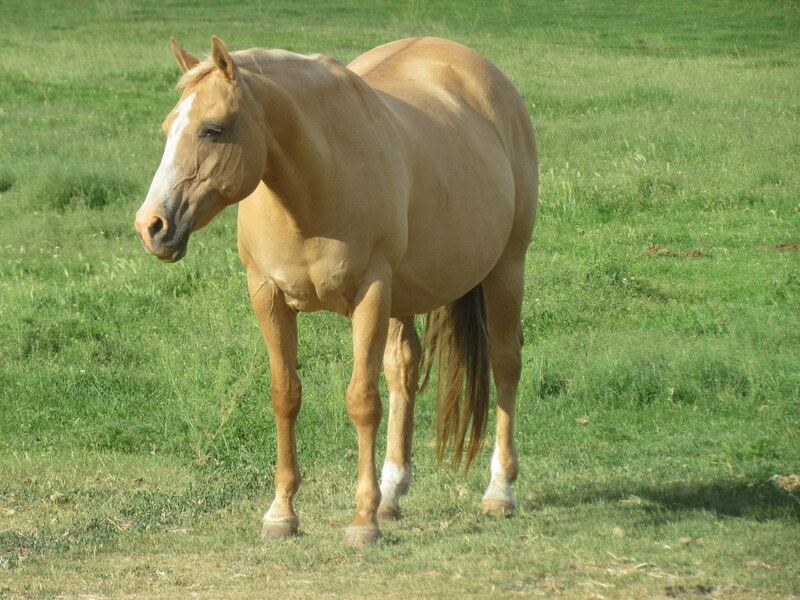 Zinks Major Kid is by John Zink 1972 – AQHA Pts and 67 Palomino Halter pts and and 119 Palomino Performance Pts . 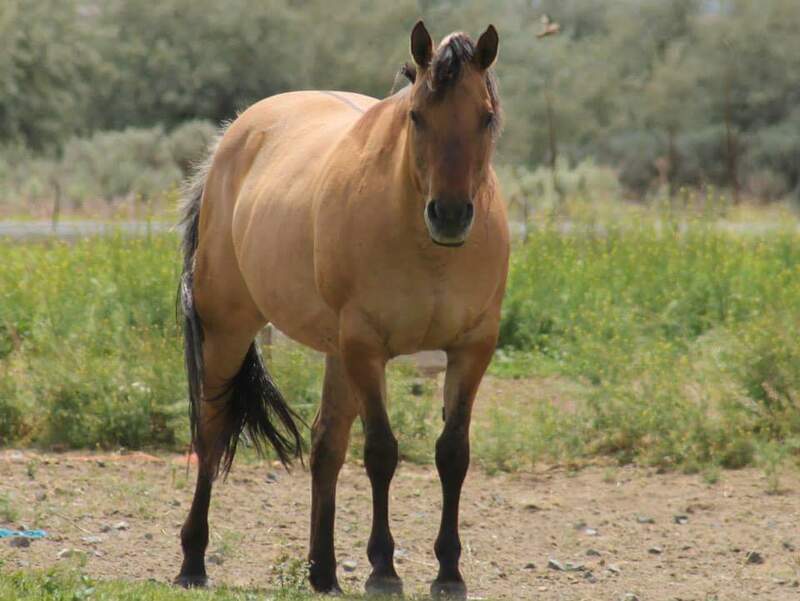 Zinks Major Kid was out of Sheza Major Star who was also shown AQHA and is by Major Bonanza. Vein Morales showed Lendy at the Yakima Fair, were she got second in halter. KT Wright on Dyna is a 2010 mare out of Dregers Harley Tucker, a daughter of Dry Doc Chex (NCHA money earner), out of a Doc Tom Tucker/King Fritz mare. Dyna is by Just Plain Starlight, “Colonel.” Harly was shown in cutting and is owned by Wagner Performance Horses of Wilbur, WA. Harley has been used for ranch work, been roped off of, used to doctor calves, and the kids can rider her too! 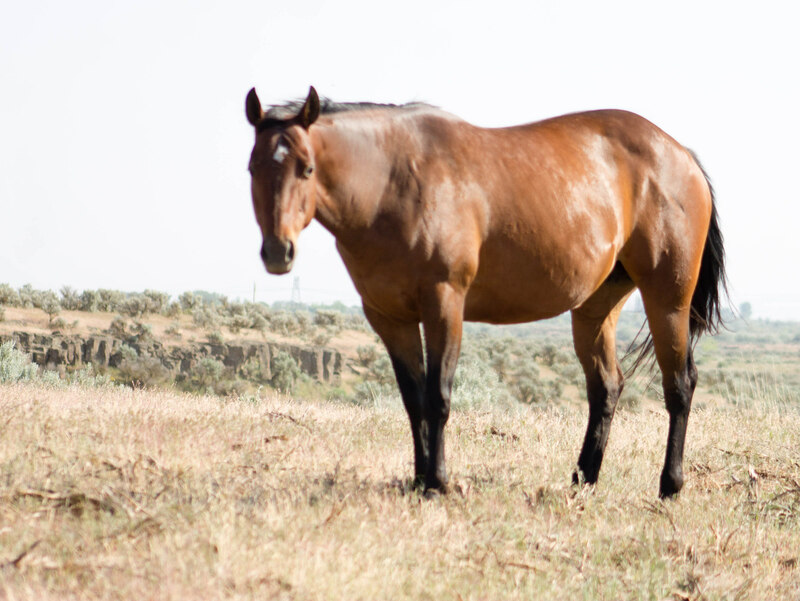 This mare’s pedigree is full of cutting/performance horses. KT Gunz N Roses was our first foal of 2013. She is by Silver Gun and out of KT Major Shasta Dais. Silver Gun was a phenomenal stallion by Playgun and out of Miss Freckles Reed. Siver Gun has 100+ AQHA Points in Heeling, Heading, Working Cow Horse, Reining, and he wa an AQHA Reserve Champion Superhorse, AQHA Champion, Sr. Heeling, AQHA Top Ten Finalist, Sr. Heading (7th), PCQHA Champion, Heeling, PCQHA Champion, Working Cow Horse, PCQHA Reserve Champion, Heeding, AQHA Performance Register of Merit is many divisions. Go to http://www.fairlea.com/silvergun.htm for more info on Silver Gun. KT Major Shasta Dais is a 2007 palomino filly is out of Totchie (Colors of Infinity), a big grey mare, and Zinks Major Kid. She goes back to Sonnys OO Buck, Docs Superstar Bar, Major Bonanza, Skipper W, and many more.